This month marks the one year anniversary of The nOATbook. I still clearly remember nervously publishing my first post and being too embarrassed to tell anyone about it until a couple of months later. One year in and 153 posts later I'm still enjoying the ride. I love that it challenges me to keep cooking new and different things and with each recipe my photography skills are also slowly improving. I've also learnt some things about this crazy blogging world and I have connected with some great people. If I had my time over I would probably change only one thing, and that is the name. The nOATbook seemed so perfect to me at the time, a play on words that would indicate that the blog was like a note book full of ideas about healthy food and living. But it just doesn't, all it does is confuse people! To anyone thinking about starting a blog, I highly recommend that you do NOT choose a name that is a play on words or that is deliberately misspelt. Google will for ever ask "Did you mean to search for the notebook?" Maybe I should have gone with something like 'The Very Hungry Teacher' or 'Eat, move, teach'? However, despite the need to constantly explain the name, I have grown fond of it and it would be far too much hard work to change it, so it won't be changing any time soon. Instead I'm trying to think of a way to design my header to make the meaning clearer. Any ideas? 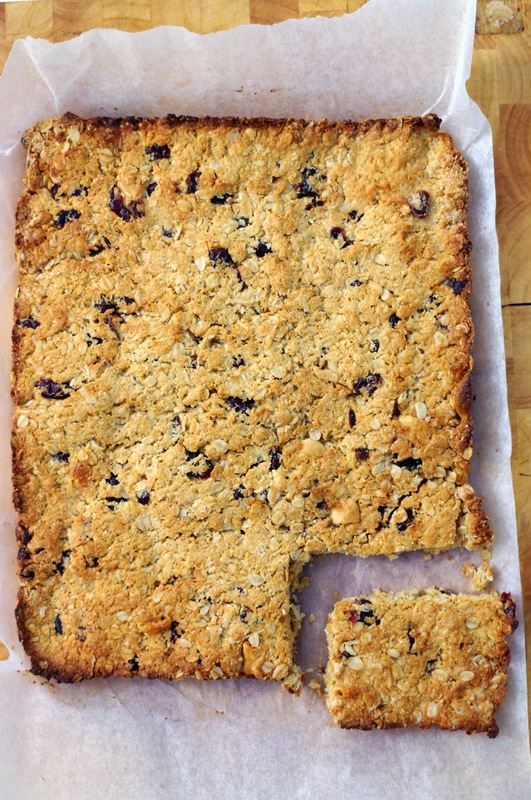 Something else that won't be changing is my love of this oat slice. Since this is my anniversary post, I thought it might me fitting to revisit my first ever post, my Oat Choc Slice. As I noted then, it is a recipe that lends itself to many variations and this is one of the favourites I listed. 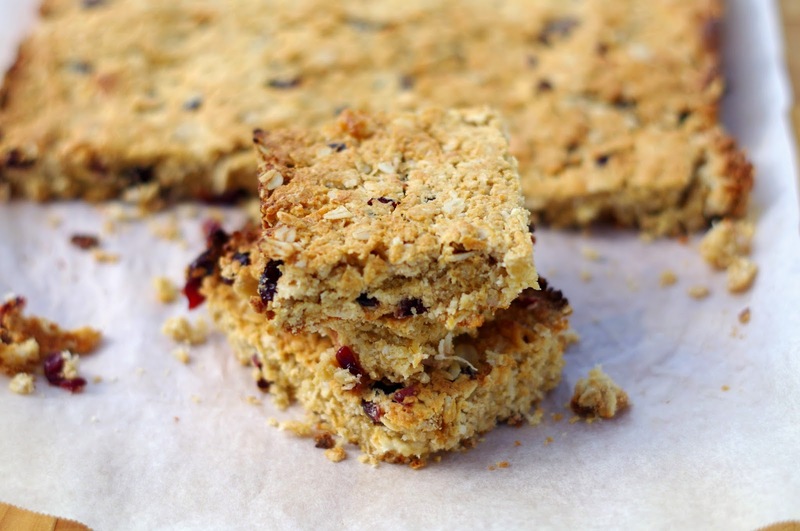 What's not to love about the combination of cranberries and white chocolate? If I could, I'd make a batch of this slice for every single person who has visited, read or commented on one of my posts. It would be my way of saying thank you for your support and kind words for the last 12 months. It truly is a lovely thing to share this space with you! Pre-heat oven to 180 degrees. Spray and line a large slice/lamington tray with baking paper. Place flours, oats, coconut, sugar, cranberries and white chocolate melts in a large bowl and mix to combine. Place bowl on scales and add apple sauce and oil. Add in eggs and honey. Mix and combine well. Place into prepared tray and bake for 25-30 minutes or until golden. Let sit in tray for 10 minutes and then place on cooling rack. Cut when completely cool to prevent slice from crumbling. Happy anniversary! There are a few things I would go back and change too, and my blog name was one of those things for a short time there. I really enjoy your blog and recipes, contrary to popular belief, I do like to eat healthy most of the time! Congratulations!! Wow! You have done SO much in 12 months!! I always love reading your blog- and it's so pretty!!! Hehe I love the pastel pink! 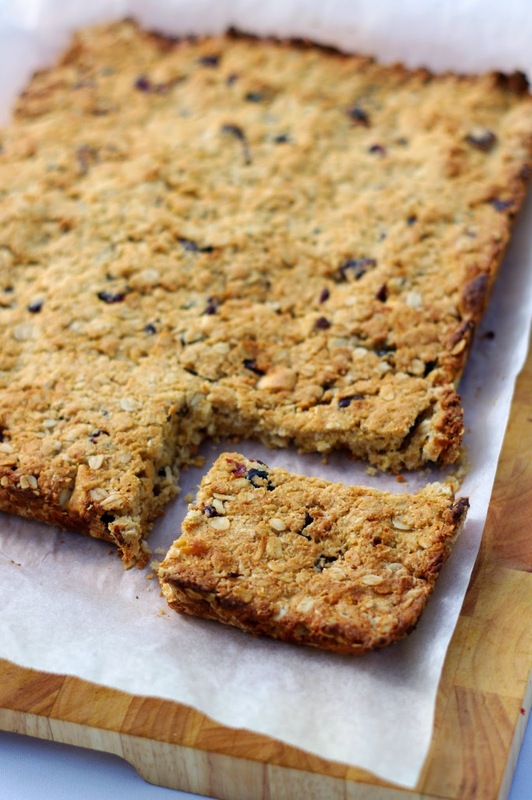 That oat slice looks incredible by the way!